It was a great source of pleasure to have your present received at home. It is kind of you to remember my birthday. I can hardly express my feelings on receiving the beautiful wrist watch you sent to me on my birthday. It is the best birthday gift I have received on my birthday. I was really in need of a wrist watch. I was planning to buy one but could not manage money. My timings would have remained unregulated without a watch. This watch is really a surprise for me. All of my friends liked and praised the watch. How should a pay thanks to you for such an amazing gift? A word of thanks seems worthless for this handsome present. Anyhow what else can I do now? If you were here I would have held in your arms. Thank you so much for such a nice gift. It will remind me your love for me. I shall take good care of it. 2. Write a letter to your friend requesting him/her to lend you camera for a week. I was really upset to know that you are not going with the school trip due to your cousin’s marriage. We are going to miss you on the trip. If you had gone with the trip, it would have been the nicest trip of our school period. Anyhow, take your time to share some enjoyable moments with your family. We are departing for our trip next Saturday. There will be one week stay in Murree. You once told me that you have two cameras your elder brother brought from Korea last year. Actually my camera is not working fine. This trip is special to me as I am going to Murree first time in my life. I want to take photographs of all beautiful places in Murree. I need a good quality camera to get nice snaps. I request you to lend me one of your cameras for a week. I will use it with care as I know how much costly it is. It will be a nice facilitation from you. I will return it to you as soon as I come back from the trip. 3. Write a letter to your mother who is worried about your health. I received your letter yesterday. I felt your love and concern for me through your words. I am feeling OK now. You need not to worry about me as I have fully recovered. Now it is just weakness followed by the disease. I am taking medicines as prescribed by the hostel physician. I have started attending my classes regularly. I am eating fresh fruits and healthy food as you directed in your letter. I will not be careless regarding my health now. Please take it easy and never take stress of my illness. I am perfectly alright. I will keep on writing to you regularly. I have to prepare for my test in physics to be taken tomorrow. Please pray for my success. I will never disappoint you in my educational performance and progress. 4. Write a letter to your father about you educational progress/ performance. I received your letter a week ago. I felt your love and concern for me through your words. I am sorry for the delay. Actually I was busy in Second Term exams. I have finished it today. I have worked hard. My performance in the exams is satisfactory. I hope I will come first in my class again. I am sure to get fee allowance if I am able to get A+ Grade in all the subjects. It’s all due to your prayers for me. I never waste a moment. I make best use of my time here. I know you have great expectations from me. I will never disappoint you in your beliefs in me. You have invested your time and money in my studies. I know my responsibilities. Keep me updated on special happenings in the village. I will come home on Uras of Baba Umar Din. 5. Write a letter to your friend congratulating him/her on his/her sister’s wedding. I received your invitation yesterday. I feel sorry to inform you that I will not be able to attend the wedding of your elder sister as I will be busy in my second term exams. I could not attend classes due to prolonged illness during the last month. I have to prepare much for the exams. I have already started taking tuition classes. I wish I could have time to enjoy the fascinating rural wedding ceremony. I have always wished to have this type of occasions to take pleasure in. Anyhow I congratulate you on this special occasion. I know you will miss me but we will be soon together on my uncle’s marriage in April 2016. Once again, accept my heartiest congratulations on your sister’s wedding. I am shocked to hear the sad news of your mother’s death. I could not believe that at once. I am greatly grieved on this tragedy of your life. Mother is a blessing of God but the divine rules are absolute. We are unable to understand Allah’s plans. She was a nice lady. She had a great heart. She was so social and loving. I can remember her soft and sweet dialect. She always loved me as her own son. She prayed for everyone and gave wise counsels to others. Her death is such a loss as cannot be recompensed. I advise you to bear this misfortune with patience. Set your goals of life and do not let her soul feel bad of you. Nothing but the time alone can soother your sorrow. All my sympathies are with you. I was overjoyed to hear about your brilliant success in final examination of grade-IX. I was not expecting such a wonderful performance from you. You once again carried the day and proved your talent. I am proud of you. You have always been a promising student. You are apple of your teachers’ eyes. I wish I could have such an aptitude as you have. Keep on working with this spirit. May Allah grant you such more joys and success in future! Accept my warm congratulations on this cheerful occasion. The competition is becoming tougher day-by-day. You have to work even harder next year. And let me know when you are giving a grand party to all of us. Your grand success surely calls for a treat. I received a phone call from your class in-charge, Mr. Saleem. He told me some unexpected things about you. It hurts me to know from him that you often miss your classes. You have even failed in English and Computer in terminal tests. He claimed that you pay more attention in outdoor sports and partying. You should be ashamed of your ways. We have strong hopes in you. Father wants to see you a doctor. Mother keeps on talking about your every time. She prays for your success. Please note that we do not expect such things from you. I warn you to mend your ways. Work hard and win the admiration of your teachers and parents. Stop all the unnecessary activities and pay heed to your studies. Give much of your focus to your studies and make up your deficiency. I hope I you will not give me a chance to say this again to you. 9. Write a letter to your friend requesting him to spend summer holidays with you. How are you? I am writing to inform you that the schools in Punjab will be closed on 15th of this month for summer vacations. I know you have not any special business during these holidays. I would be free for the first 20 days before I join summer camp on 5th of the next month. I invite you to come here at Kasur to spend some of your holidays with me. Kasur is a historical city with many places of worth seeing. If you reach here before 20th of this month, we will have much time to visit important places of Kasur. We will visit the shrine of Baba Bulleh Shah, the great saint and Sufi poet. We will visit Ganda Sing border which is an attractive place in tourist point of view. We will pay a visit to river Satluj lying on Indo-Pak borders. It will be fantastic time for both of us. I have planned everything and waiting for your response to give final touch to my planning. Please let me know when you will reach. Do bring your camera along as you know my camera takes low quality photos. I have taken the examination of class 9th. Now I am free for 25 day before the new classes start. I have been busy in preparation for the exams and could not find time to study my favorite authors. I know you have a nice collection of Urdu novels and books. I would like you to lend me ‘Mein Ek Jasoos Tha’ by Tariq Ismaeel Sagar and ‘Zero Point’ by Javed Chaudhary for two weeks. I want to serve to my thirst for Urdu literature. I assure you that I will use them with care. I will return them within two weeks. I can share some of my own with you if you like. Send me these books as soon as possible. 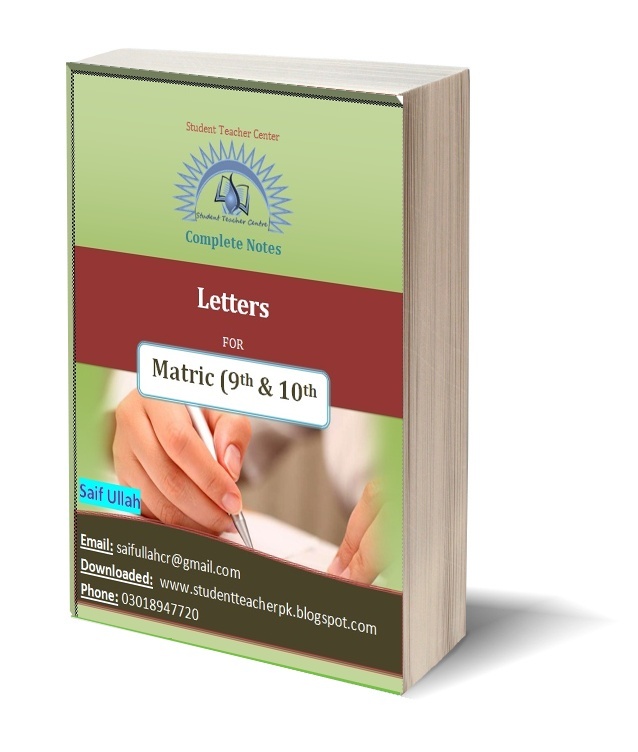 Download complete book containing all letters for Matric Classes written above. 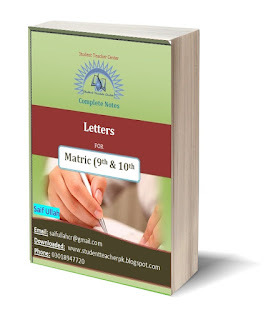 This is an E-book that you will get free after entering your email. You may refer to important message on right bottom corner of the blog.